In 1908 and 1909, the British believed that combat ranges were rising, and that they'd pushed the 12" gun as far as they could. The ships that took the 13.5" gun to sea were a radical departure from the previous generation of battleships in other ways, with the abolition of the wing turret and a significant jump in size. 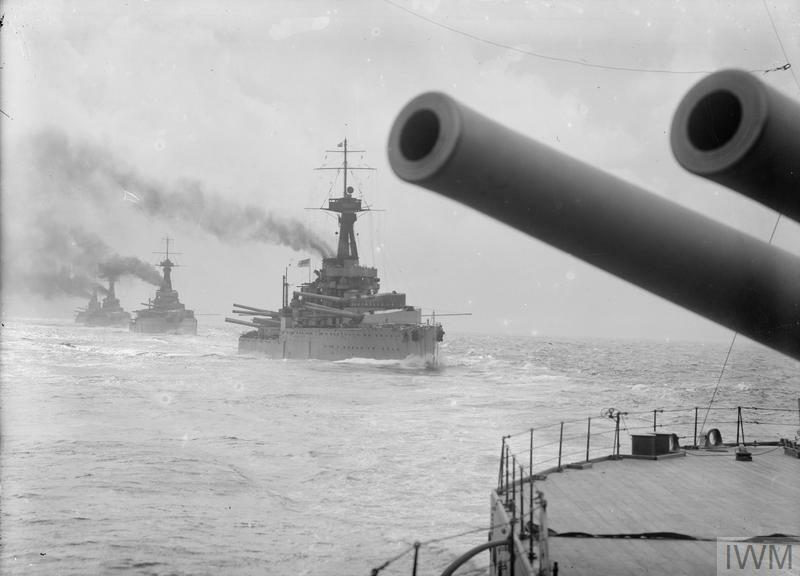 The four Orion class battleships were the result of the famous 1909-1910 program, when the British became convinced that the Germans were planning a major building campaign to overtake them at sea.1 Instead of the normal three-ship programs of the era, four ships were bought initially, the two ships of the Colossus class, the battlecruiser Lion, and Orion. Later, under public pressure, another three units of the class were ordered, as well as the battlecruiser Princess Royal. The most obvious difference between Orion and her British predecessors was the all-centerline arrangement of the turrets. 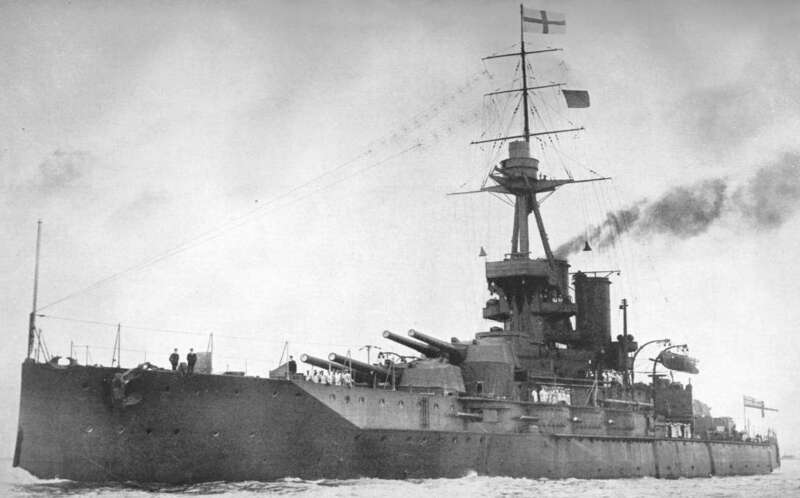 The 5 turrets produced the same broadside as the previous Colossus class, but without the blast damage concerns of the cross-deck turrets. The superfiring arrangement was used more to keep down length than out of any concern for end-on fire, which wouldn't be solved in British service for almost a decade. The new guns were an even bigger improvement over their predecessors than the new turret arrangement, with greater range, better accuracy, and improved hitting power. Accommodating the bigger and heavier weapons meant that the ships had to grow, reaching 22,500 tons, about 10% heavier than the previous classes. The armor was also significantly improved. The belt was 12"/9"/8", extending all the way to the upper deck, running a deck higher than in previous ships. The armored upper deck was still thin, only 1.5", but this was expected to be no problem at the short battle ranges of the day. Of course, the story wouldn't be complete without Fisher attempting to increase speed. He pushed for a 23 kt ship, which would have been 35' longer than Orion. While this doesn't sound like much, the Orions, at 545', were pushing up against the limits of existing British docks. In the end, this was probably secondary to the extra cost, which would have been £500,000 on the £1.8 million of the ships as built. One significant flaw in the Orions, and all of the 1909-1910 ships, was the single mast, placed behind the forefunnel. This arrangement, pioneered in Dreadnought, was intended to allow the single mast to be used as a crane for boat handling. Unfortunately, this put the top directly in the smoke and fumes from the forward funnel. This was mildly tolerable in a relatively low-powered battleship, but the Lion class battlecruisers had to be rebuilt to fix it. The Orions were followed a year later by the King George V class. These ships were very similar, with the only visible difference being the repositioning of the foremast ahead of the forward funnel, solving the big problem of the Orions. More subtly, some of the guns of the secondary battery were fitted with 3" armor plate, to protect them in action, and they were rearranged to focus more firepower forward. This was a sign of the increasing importance of the secondary battery during main fleet battles. Previous secondary arrangements had been designed around night attack by small torpedo boats, focusing on good fields of fire all around and providing no protection for the crews. However, many thought they had not gone far enough, and attributed this to Jackie Fisher's influence. He had overseen the removal of the 6" gun from the battleship with Dreadnought, and was strongly opposed to reintroducing it. His retirement in 1910 cleared the way for the next class to gain a 6" secondary battery. Armament upgrades were minor, with 1,400 lb shells replacing the 1,250 lb shells of Orion's guns, and Q turret gaining slightly better arcs. 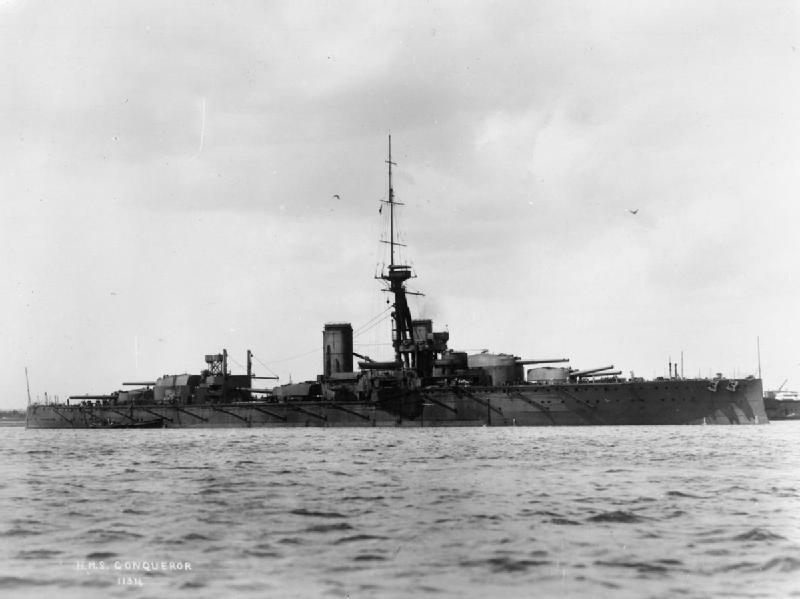 The King George Vs never achieved distinction in combat, their most notable accomplishment being that one of them, Audacious, was the only British dreadnought battleship lost to enemy action during WWI. On October 27th, 1914,2 she struck a mine off the coast of Ireland, and sunk over the next few hours due to inadequate watertightness and poor damage control. With Fisher's retirement, 6" secondary guns became viable, and the four ships of the Iron Duke class were built under the 1911-1912 program. The most obvious change was the replacement of the 16 4"/50s with a dozen 6" guns. These guns were much heavier than the secondary guns of the King George Vs, and their protection was doubled from 3" to 6". The increased weight meant that the guns had to be moved from their positions in the superstructure down to casemates in the hull to protect stability. Five of the casemates on each side were mounted in the forecastle, while the last pair was aft. A 2,000 ton increase in displacement was necessary to accommodate the improved guns. 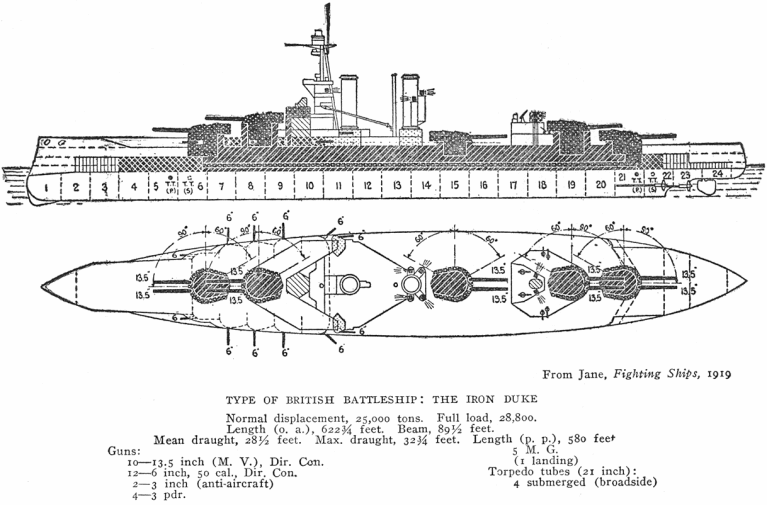 The Iron Dukes had four broadside torpedo tubes, instead of the two broadside and one stern tube of the previous classes. There were minor improvements to the armor, too, although nothing particularly notable. In service, the casemates proved to be less effective than expected. The aft casemate on each side was so wet that the guns were soon removed in 1915 and mounted in the open on the forecastle above the other guns. The forward battery was somewhat better, but when the ports were opened, water from the bow wave would enter the ship. Crews often found themselves manning guns in several inches of water. 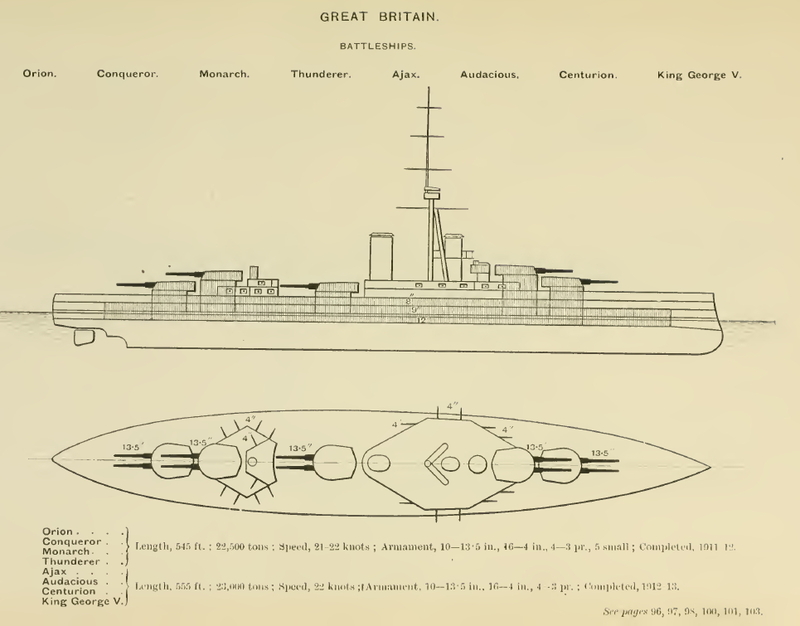 This was a problem for all casemate mounts on dreadnoughts, although the placement of Q Turret at the main deck level meant that the battery was rather further forward than the designers would have liked. Benbow. Note the indents for the aft casemates, near the aft turret. 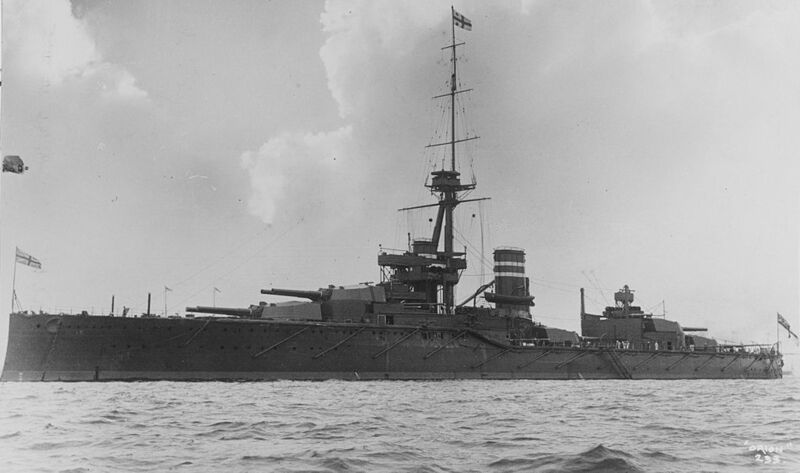 The Iron Dukes were the last and best of the classical British dreadnoughts, coal-fired and capable of 21 kts. Their successors would prove a radical departure in terms of armament, speed, and propulsion. 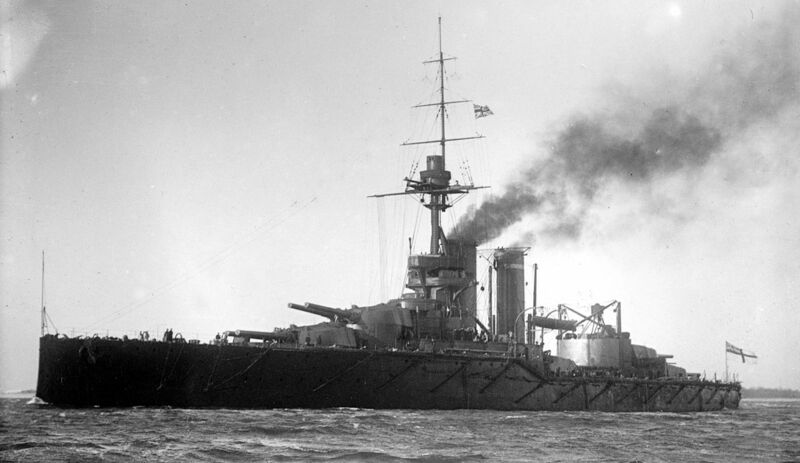 But the super-dreadnoughts formed the core of the British battlefleet during the First World War, with Iron Duke serving as Jellicoe's flagship at Jutland.